An advance party of eleven Trundlers assembled in Queenstown on the afternoon of Wednesday 20 February. Three of the group [numbers 3, 9 and 16] had done some serious altitude training under the direction of number 29, in preparation for the tour. After watching number 16 get fleeced by a Travelex ATM, the group moved to the new accommodation at Arrowtown, chosen by number 3 to separate vulnerable tourists from the many distractions of Queenstown. Under the direction of number 45, improbable quantities of refreshment were procured in anticipation of the welcoming and portfolio allocation session. With other grounds already rendered unavailable by the local obsession with rugby, COWs hosted us at the pleasant rural field in Oturehua, whose cricket club was founded in 1929. The task we faced was put in perspective by a quick calculation in the mini-bus, revealing the average age of the touring party to be 59.4, as we met our more youthful opposition. COWs batted first and set off at a cracking pace, taking 23 from the first six overs. Brewery was introduced to the attack and broke the opening partnership with his second delivery. Ted then succeeded in having a catch hit to the captain’s safe hands and Brewery rearranged the next batsman’s stumps to have the COWs 3-50. A succession of solid partnerships took COWs to an imposing total of 9-197. Toru and Brewery both finished with 3-23, the other successful bowlers being Ted and Trickster. Trickster then opened the batting with Toru and quickly raced to the retiring score, with numbers 3, 9 and 6 all departing for single-figure scores. Theo, Brewery and Harmy all made useful contributions, but the required run-rate steadily increased. We were given some hope by a rapid-fire 33 from Saint, including five 4s and a massive 6 which cleared the high fence behind the clubhouse and landed in the middle of the tennis court! After Ted and Ace were dismissed, our two retirees were back in the middle and fieldsmen disappeared into the middle distance as Trickster smashed boundaries. With 21 required from the last over, he miscued an attempted big hit and was caught for 49, including six 4s and two 6s, to leave us all out for 177. An extremely pleasant period of socialisation followed before we set out on the long drive back to Arrowtown. The arrival of number 61 reduced the average age of the party to 58.6 so we set out with a spring in our collective step on the very short trip to the Millbrook ground, now boasting a white picket fence and practice nets as well as the elegant pavilion. Tricksters, yesterday’s stand-out form batsman, opened with Saint but was dismissed in the second over. He was followed back to the shed by Brewery, who failed to take advantage of a rare dropped catch behind the wicket by Steve Fraser. Numbers 5 and 6 fell agonisingly short of the retirement score, being dismissed for 28 and 27 respectively, while Rowdy, Harmy and Toru all scored 15. Toru’s dismissal, caught on the boundary from a bowler whose three previous overs had gone for 18, heralded an amazing feat when Magic and Ace were caught from the next two deliveries to complete an unexpected hat-trick. That eventful last over saw our innings subside to a disappointing 9-151, a score that was never likely to be enough on the Millbrook synthetic wicket. The opening batsman raced to a fifty partnership, despatching Ted and Rowdy for six 4s and two 6s before the introduction of Brewery and Ace slowed the scoring rate. With three of the first four batsmen retiring, Millbrook moved effortlessly to 2-152 in only 28 overs. Trickster and Ace were the only successful bowlers. After the usual socialising at the ground, and ritual presentation of duck-shirts to Ace and Brewery, several Millbrook players accompanied us back to our nearby Arrowtown accommodation and celebrations continued late into the night. 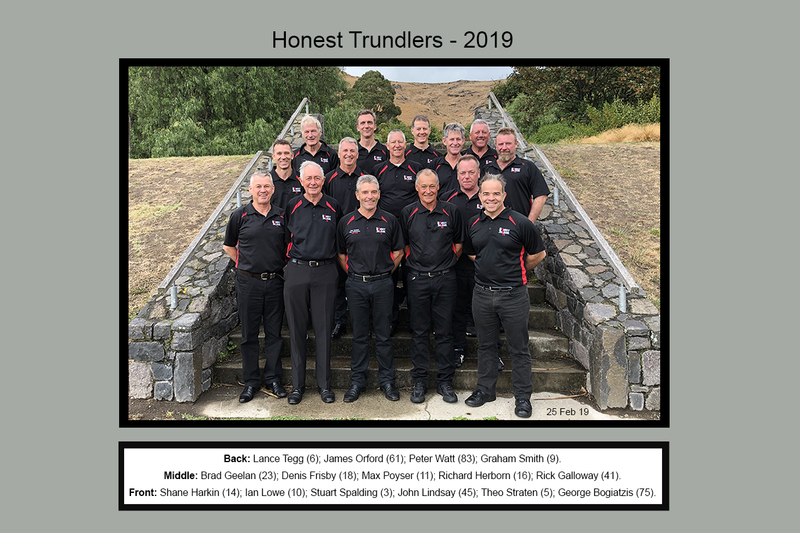 On Saturday 23 February, the twelve Trundlers boarded a flight to Christchurch, where our numbers were reinforced [and our average age reduced significantly] by the arrival of fresh legs from the mainland. Carbon #23, Datsun #75 and Watty #83 joined us at the Ashford Motel and we then met #67 Commander Banks for an afternoon net session. With the iconic Valley of Peace ground undergoing total reconstruction, the traditional Sunday game was moved to the artificial pitch at Swannanoa; probably a good thing, because the weather was very unkind and it might not have been possible to play at the Valley. We were delighted to have Willy and one of his colleagues arrive to umpire on a cool and damp day when nobody fancied going out to help them. We were greeted by our old friend the Jockey #26, unfortunately on crutches after an ill-advised second run the day before. Our innings started disastrously when Datsun was bowled by Jif #29, opening the bowling for Valley. Trickster and Forgetalot moved smoothly to retiring scores, with Watty the only other wicket to fall in the first twenty overs, at the end of which we were 2-91. Valley also started strongly and had reached 1-86 in their first twenty overs when we paused for lunch. After lunch, we accelerated our scoring. Carbon and Saint both retired, while Sharkin and Harmy weighed in with brisk scores of 24 and 25 respectively. At the end of the 40 overs, we had reached a competitive total of 5-224. With the ball damp, it was not easy to take wickets, but all the bowlers were steady and backed up by some enthusiastic fielding. Despite a hard-hitting innings by Jif, Valley were always slightly behind the required run-rate. With perfect symmetry, after having been five runs behind at the half-way mark they were ten runs short at the end. Saint, Brewery, Trickster and Datsun each picked up one wicket, while Toru and Rowdy also bowled tight six-over spells. After the presentation of the trophy, both teams adjourned to the China Kitchen for the traditional evening meal. After heavy rain overnight and another shower in the morning, we assumed that the Heathcote wicket would be unplayable and the match transferred to the nearby synthetic pitch where we had played in 2018. It was a very pleasant surprise to find that the ground was in very good shape, largely because the preceding six weeks had been very dry. All that was needed was some sawdust on the bowlers’ approach at the southern end, allowing the game to start on time. Heathcote batted first and, as usual, JG teed off on our opening bowlers. With two retirees, Heathcote raced to a daunting 1-153 in their first 25 overs. Our response began slowly against a very tight opening attack, and we were only 1-22 after nine overs, with Datsun back in the shed. Magic and Watty both reached the retiring score of 40 to see us 4-127 after 25 overs, trailing by 26. We had another session of chasing leather after lunch as Heathcote went on to reach 4-272 at the end of their 45 overs. The only respectable bowling figures were Brewery’s 1-11 off five overs. With an imposing target of 146 from 20 overs, Trundlers went on the attack. Theo was unlucky to be caught on the boundary after a quick-fire 34, including four 4s and a 6. Saint also reached the retiring score of 40, Rowdy and Toru weighed in with valuable contributions, and retirees Magic and Watty came back in to chase the target, but we were dismissed in the 44th over for 253. We had made up some ground, but the lead after the first 25 overs was just too big a gap to bridge. After the presentation of the Broken Inn trophy, both teams adjourned to the Valley Inn for food and drink. We arrived again at Swannanoa’s ground [the SCG] to find the weather significantly warmer than when we had been there on the Sunday; the evidence of the cooler weather was the snow visible on the hills beyond the ground. As is now traditional at this venue, the children from the local primary school came over to the ground and sang us a welcome. It was agreed that both teams would bat 12 and field 12, with a compulsory first slip in place throughout. Datsun took two early wickets in a fine opening spell, but the other Swannanoa batsman had little trouble; after the first 25 overs, the score stood at 2-148. We also lost two early wickets. Saint and Trickster again reached the retiring score, but we lost wickets regularly and after our first 25 overs, we were a precarious 5-130 at the lunch break. Invigorated by the fine spread on offer, our bowling and fielding stepped up a notch for the afternoon session. Tight spells by Toru, Rowdy and Trickster saw Swannanoa struggle to 6-234, meaning they had only added 86 runs in the 20 overs, despite having plenty of wickets in hand. Needing 105 to win from our last twenty overs, we saw Rowdy and Datsun retire, then Harmy scored a quick 18 before running himself out. Sharkin, Theo and Brewery weighed in with very useful contributions before Saint and Rowdy returned, the latter getting us home with one over to spare with a crashing cover drive off the back foot. The two teams adjourned to Jockey’s home for a sumptuous Japanese meal and extended socialisation. The Herders batted first and began slowly against steady bowling from Rowdy and Brewery, who only conceded five runs in the first four overs. Gradually the batsmen got on top to reach 0-93 after the first 20 overs. All our early batsmen except Lance got a start, and after 20 overs we were a competitive 2-86 with Datsun and Toru both having retired. The Goatherders accelerated in their second session to reach 5-218, with four of their batsmen having retired. Brewery again starred with the ball to return the excellent figures of 3-21 from his six overs. Our middle order fell away in the run chase. Rowdy scored 28, Saint was dismissed for the first time on tour for 23, Datsun returned to reach 36 and Toru remained not out when our innings folded for a disappointing 192. Both teams moved to the nearby café, where our evening meals had been pre-ordered. After a convivial session we set out on the road to Akaroa, where we arrived to find drizzling rain. The rain had cleared to a cool, crisp morning. As had happened many times before, Pointer and Snow Goose opened for Akaroa and absolutely teed off. After only six overs, Pointer had retired and the Herders were 0-47. Trundlers were glumly looking to chasing a score close to 300. Brewery came on and immediately took a wicket, then Ace began a match-turning spell with two wicket-maidens. After 20 overs, Akaroa were a rocky 5-112. Trundlers began confidently on the synthetic wicket, so the only dismissal in the first 20 overs was Steve Fraser being run out! Datsun, Saint and Toru all reached the retiring score, so we were comfortably placed at the lunch break with 1-118. After the usual great Akaroa lunch, including seafood successfully hunted that morning by Datsun and Watty, Ace continued his fine spell. Trickster and Brewery also weighed in with wickets to restrict the Herders to 195. A rare experience for the ages: Bob Masefield was actually bowled twice in one afternoon! With wickets in hand and only 78 needed from 20 overs, the run chase was always under control. Watty and Theo each scored 22, with useful contributions from Jason and Harmy to see us home in the 38th over. The traditional meal at La Thai followed drinks and presentations at the ground. The now-traditional final match of the tour was a ten-a-side fixture this year. Harmy’s Jungle XI batted first and were 4-114 after 20 overs, with Jingles, Roly, Steve and Theo all having retired. In reply, Jif’s 29ers were a comfortable 2-102 with Compass and Forgetalot both having retired. After lunch, Jason and Toru retired, then Jingles and Roly returned for some vigorous hitting to take the Jungle XI to an imposing 5-218. Jif’s team were always struggling after a devastating spell by Harmy, leading from the front to remove Brewery, Ace and his opposing captain Jif in five action-packed overs. Magic and Bob Masefield were left with a challenging run-rate, coming down to needing 44 from the last two overs. After 15 from the 34th over, Bob took to Roly’s bowling on the hope of an improbable 29 from the last over. With two sixes and two fours from the first four balls, anything seemed possible. It came down to needing another six from the last ball to win. Bob swung mightily to the leg side, but the ball landed about a metre inside the boundary, to give Harmy’s Jungle XI an exciting win by just one run. After the usual post-match socialisation, the Trundlers cleaned up for the end-of-tour dinner at Bully Hayes. 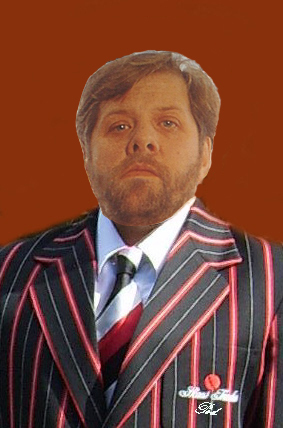 Number 6, Lance Tegg, a.k.a Forgetalot, was a popular choice as Man of the Tour. Well done Whispering Ted a good read !